“Recently the world was ruled by the big power Idols with their overwhelming magic. In the cutting-edge, metal-meets-idol world of BABYMETAL (and yeah, it’s always in caps), February 2014 was a memorable month in an already memorable year. Groundhog Day found the trio in Taiwan performing with the death-metal act Chthonic, a concert covered by that country’s national news. February 7 saw BABYMETAL appearing alongside one of the many versions of AKB48 on the venerable Music Station (Japan’s equivalent of Tops of the Pops), with host Tamori—and everyone else on stage—flashing the camera BABYMETAL’s famous Kitsune-sign. Next, Amuse Inc. (the omnipresent talent agency with a wisp of the menacing) released a frantic trailer for BABYMETAL’s two-day super-show at the Nippon Budokan held March 1 and 2; the planet discovering BABYMETAL would be the youngest act (average age of 14.6 years) to ever play a one-man event on the hallowed stage. All of this in preparation for the drop of BABYMETAL’s self-titled debut album on February 26. Inevitably released in two editions (Limited and Regular), the Limited Edition (with a DVD pumped full of video goodies) has been topping the CD-Japan chart since December just in pre-orders, only occasionally pulled down a couple of slots by the likes of Kyary Paymu Paymu or AKB48. The actual Japanese release was reminiscent of the latest Grand Theft Auto launch, replete with enormous line-ups, costumed fans and a carnival-like atmosphere which included a variety of BABYMETAL-themed exhibitions and at least one transport truck emblazoned with the girls in their most recent guise pushing the Budokan concerts. Later on the 26th, a vibrant if not animated Su, Yui and Moa took to the airwaves and internet via TV Saitama’s Hot Wave to celebrate the album’s release and to announce their Budokan shows were sold-out. As BABYMETAL invoked the Fox god on TV Saitama, simultaneously a variety of internet feeds and blogs reported BABYMETAL had rocketed to the number one position on iTunes USA metal chart…that’s right, the USA metal chart. BABYMETAL Limited Edition, which I’m happy to report YesAsia shipped to me double-time quick, is certainly worth the price of admission. Interestingly, many of the websites selling the Limited Edition mark the DVD as Region 2. I dunno about that, because mine is Region Free. And it’s great. 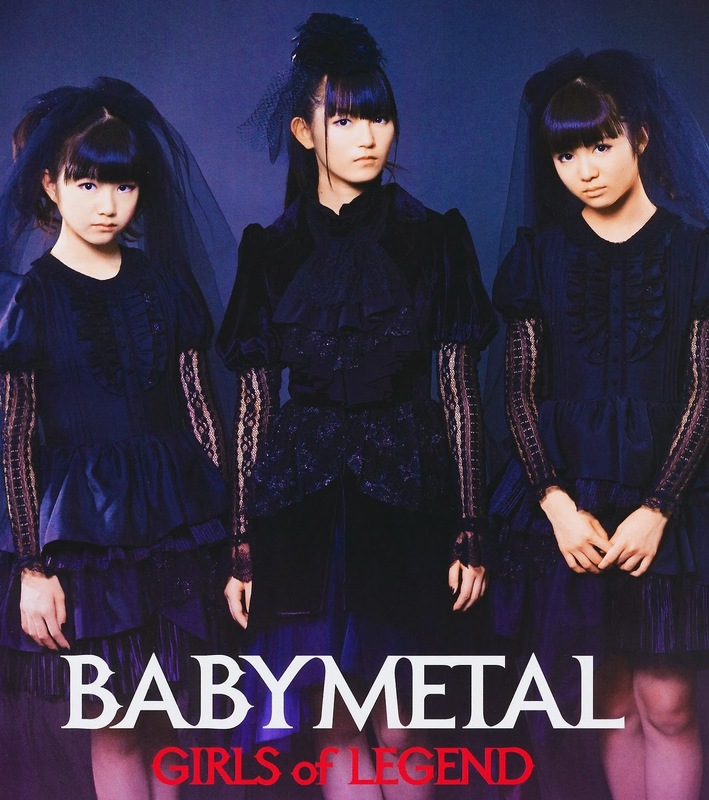 Not only do you get the album (CD), but also a DVD which includes five music videos of previously-released singles, a video of “Give Me Chocolate” performed live at Su-Metal’s Seitansai (21 December 2013, Makuhari Messe Event Hall), and the entire paradigm-shifting experience that is BABYMETAL on-stage at Summer Sonic 2013 (a stellar presentation of five killer tracks). Unlike the live performances, the music videos have audio commentary tracks with Su, Yui and Moa, which leaves one cursing the fact they were never taught Japanese, because no one at Amuse saw fit to give subtitles for any of the video material, let alone commentary tracks. This being said it is fun to hear. The girls are clearly having a blast, and catching Su laugh “Sugoi!” or the très kawaii Yui and Moa giggling at their own performances is adorable. As successful as BABYMETAL are, it’s critical to remember they’ve never released a full album…at least until now. And it’s worth consideration, as it speaks to the band’s stunning rise: BABYMETAL dropped their first record three days prior to playing the Nippon Budokan, one of the most important venues in rock history, a stage built for the 1964 Olympics, a stage which hosted its first rock act in 1966…the Beatles. The thirteen song disc is essentially a collection of previously released singles, though BABYMETAL diehards have been breathlessly waiting for its three new songs since the album was announced in December. Not unlike watching BABYMETAL live, the disc opens with “BABYMETAL Death” (a play on the Japanese word ‘desu’…“BABYMETAL desu” meaning “We are BABYMETAL”), an ultra-heavy-bordering-on-grindcore warm-up song used during live performances—BABYMETAL and their fans spell out the band’s name in astonishing displays of unity. The disc drifts naturally into “Megitsune”. “Megitsune” (female fox) is BABYMETAL’s most watched video on YouTube at some 2.2 million hits as of this writing. When it was first released as a single in June 2013 it was widely viewed as BABYMETAL growing up in tandem with their music. Lyrically more complex than previous outings, “Megitsune” questions the role of women in Japanese culture. Musically, it seamlessly blends technically proficient metal, idol and kawaii-pop with subtle hints of the traditional Japanese in a flourish of riffs and heavy breakdowns that leave the listener dazed. It’s BABYMETAL operating at their finest, and remains a prime example of “what the big deal is” when it comes to this act. “Gimme Chokko!” is one of the three long-awaited new tracks on the record, and an extremely entertaining piece of music. Another flawless execution of J-pop-meets-metal, it started making the YouTube rounds in partial form as a short video released by Amuse at the beginning of February—it turned up in a full form immediately following the album’s release. 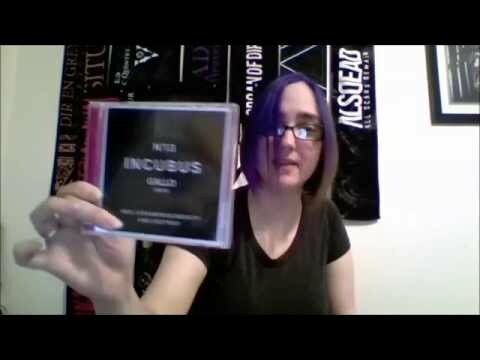 The full form video for “Gimme Chokko” is also enclosed with the Limited Edition DVD. Incredibly high-energy, as if simulating the chocolate rush they so clearly crave, it also marks yet another evolution in BABYMETAL choreography. “Ii ne”, translated variously as “Sounds good”, “So good” or “It’s good”, is one of BABYMETAL’s original tracks, going back to the time of “Doki Doki Morning” (BABYMETAL’s first single, 2011). Everyone’s fond of pointing out “Ii ne’s” brief moments of hip-hop. Myself, I prefer the Kitsune-fueled-inferno of a breakdown immediately following Yui’s and Moa’s cry of “Kitsune da wo!” (Put up your Kitsune!). “Ii ne” is a wonderful mash of brutal metal, speed-techno, pure joy and kawaii. Aside from the early music videos, live performances of “Ii ne” coupled with “Doki Doki Morning” and “Headbanger!” were the first BABYMETAL seen by the west. Additionally, it was this material that shaped a new genre, a genre which has come to be known as “kawaii-metal”. “Akatsuki” (Crimson Moon) is the b-side of the “Megitsune” single. It’s a poignant and elite BABYMETAL track, an example of Su-Metal’s vocal talent, which explodes in “Akatsuki”. It’s a Su-Metal solo (no Yui, no Moa), and it’s this song which earns Suzuka Nakamoto the title “Princess of Metal”. And earns is the word…check out the lyric translations, then check out the video from a performance of “Akatsuki” during Legend ‘Z’ (Zepp Tokyo, February 2013). If you follow these instructions, you’ll be properly prepared the next time you read a review calling BABYMETAL “saccharine” or the lyrics “empty”. “Onedari Dai Sakusen” (Beg-dad-for-it Operation) is the first of two BLACK BABYMETAL songs found back-to-back on the album; BLACK BABYMETAL is Yui and Moa operating without Su. While vaguely (if not unfortunately) reminiscent of Limp Bizkit, the surreal presence of Yui and Moa quickly end that comparison…as does the Exorcist-esque, Tubular Bells-like keyboard line. To tell you the truth, it was upon hearing the keyboard line in “Onedari Dai Sakusen” that I fell in love with BABYMETAL. Oh sure, there are better songs. Absolutely. But there’s a je ne sais quoi to that keyboard line…perhaps best captured by a fan-edited video. Not bad for a couple of 14 year-old girls. Next, and employing the same Japanese onomatopoeia found in “Doki Doki Morning” (translated roughly as Heartbeat Morning), “Uki Uki Midnight” (translated roughly as Cheerful Midnight) is pure, carefree madness, even by BABYMETAL standards. The first time I heard the track, I looked at the person next to me and said, “This song has no idea what it wants to be.” I stand by this. Don’t misunderstand me, I like the song. It’s just that it truly doesn’t know what it wants to do. 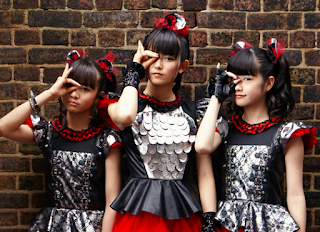 Whereas BABYMETAL succeeds enormously when they mesh pop and metal, “Uki Uki Midnight” is a study in segmentation. One moment a straight-up pop song, then abruptly a straight-up thrash song, and then abruptly—for some wonderful reason—a straight-up dub-step song. And I’m not exaggerating. Check it out. Standing as a perfect example of kawaii-metal, “Catch Me If You Can” first appeared as the b-side of the “Ijime, Dame, Zettai” single. It reminds one of SlipKnot in its execution, with industrial-sounding breakdowns and growling vocals. The lyrics suggest it’s a game, and “Catch Me If You Can” comes across as if BABYMETAL are playing tag with a demon. “Akumu no Rondo” (Nightmare of Rondo) is the third new song on the disc. Another Su solo track and a personal favorite, it’s everything I’ve said about “Akatsuki” and maybe more. “Akumu no Rondo” stands as the darkest BABYMETAL to date. It’s moving, heartrending, lyrically cryptic and sonically relentless. I can only recommend playing this song as loud as humanly possible. “Headbangya!” (Headbanger!) was released in 2012 as a follow up to the initial success of “Doki Doki Morning”. It continued Amuse’s experiment with kawaii-metal, and like “Doki Doki Morning”, it remains a staple of BABYMETAL to this day. The music video, which misrepresents the band, had some mild viral success in the west. In live shows, “Headbangya!” is used in a variety of ways. Sometimes Yui and Moa will spray the audience with giant fire extinguishers; during Legend ‘D’, “Headbangya!” was performed as the bizarre but brilliant “Night of 15” remix. And of course “Headbangya!” is used with the kami-band (kami being loosely translated as divine). It should be explained BABYMETAL use two separate live bands. First, there’s the “Mr. Bones”, musicians dressed head-to-toe in skeleton suits flailing at instruments. But then there’s the kami-band, hired guns, pros with white-painted faces and white robes, employed by BABYMETAL to blow the roof of any venue…for example, Legend ‘Z’. The final cut on the record should have been the first. Released in January 2013, the single “Ijime, Dame, Zettai” (Bullying, No, Absolutely) established BABYMETAL as more than just a novelty. “Ijime, Dame, Zettai” opens with Su-Metal’s battle-cry of youth and a detonation of sound. A perennial fan favorite, it has essentially become BABYMETAL’s signature piece, and it’s not unusual for adoring audiences to replicate the ‘Wall of Death’ stage-antics of Yui and Moa. A summer European tour was announced in the final moments of their March 2 Budokan show. ‹ Anime North 2014 – Less Than 5,000 Passes To Go! › Band Feature: Jungles!!! Teaser!